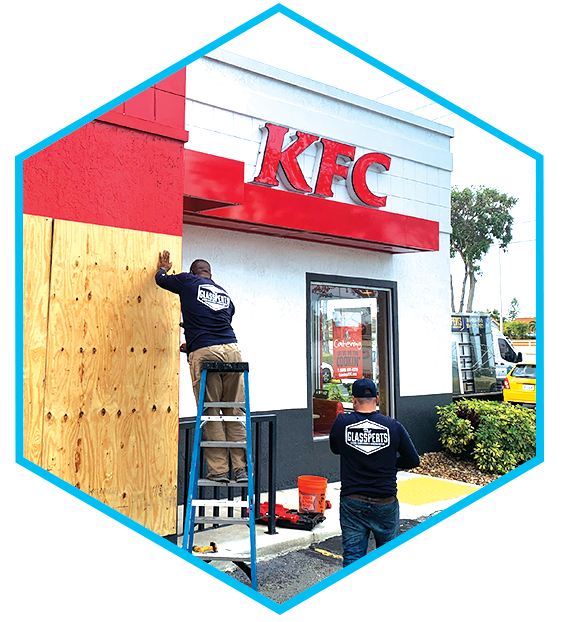 When it comes to commercial glass repair, you won’t find any company in Miami-Dade or Broward counties that can match our level of service or expertise. All our technicians are fully trained and keep their vans fully stocked with replacement parts. This means most jobs can be done on the spot, helping restore your sense of security as soon as possible. We even do free estimates. WHY should the glassperts be your commercial glass repair company? WE EMPLOY ONLY HIGHLY EXPERIENCED GLAZIERS IN OUR COMMERCIAL GLASS REPAIR SERVICES TO ENSURE YOU ARE GETTING THE BEST SERVICE WHEN YOU NEED IT MOST. You don’t get to decide the next time an accident or a burglary happens. However, you can pick up the pieces quickly and get your business back on track with The Glassperts. After all, your customer’s safety and your business security are of the utmost importance. Simply give us a call for 24/7. Our vans are always in your Miami-Dade or Broward county area, so you know we can be there fast when you need us. Our commercial glass repair company is fully equipped to handle almost every glass repair job on the spot. When you need us, we’ll meet you on site, provide a free estimate, walk you through the repair process and costs, and get you fixed up in no time. What Can You Expect From The Glassperts? When it comes to business, we understand that time is money. You simply can’t afford to spend a lot of time waiting for glass repair. You need your business restored as soon as possible. At The Glassperts, we pride ourselves on our excellent customer service. This means we will be with you from beginning to end, walking with you every step of the way. When you choose us, the first thing we’ll do is clean up all the glass and debris, board up the windows — if your glass needs to be special ordered, and get your windows or door looking good as new as soon as possible. In fact, we guarantee we’ll do such a good job, you and your customers will feel like it never happened. Over the years, we have earned an exceptional reputation in Miami-Dade and Broward counties for our capacity to deliver quality products and professional installations at a competitive price. Whether you need commercial window or door glass repair, The Glassperts have you covered. Over the years, we’ve seen a great number of unique situations and needs, so there’s nothing that will surprise us. We’ll do everything in our power to return your business to normal as soon as possible. You don’t get to choose when and what type of damage will happen to your business, but you can choose which company you call to make it right. Contact The Glassperts today for your commercial glass repair needs in Miami!